Occasionally, due to overlapping qualities and needs, you might find it hard to distinguish between these three and I will do my best to highlight some examples. And many more little items, including a measuring tape as many high school track meets in Utah are so bad there isn’t always a tape for the discus. The list included practically everything you could “forget.” Here is the key: as you do the same thing more and more often, you are going to slip on the basics. When I run a workshop, like an HKC for dragondoor, I send the host a checklist that includes the little things. Nametags are almost universally the most overlooked item because we worry about flights, meals and hotels, things that can be taken care of months ahead, and miss the tiny packet of nametags that will simplify my life for the entire workshop. On a side note, Paul’s mom, Susan, took over my old position and she recently told me that she still uses the same Monthly checklist I came up with a decade or so ago and the 18 Month Checklist for big events. I used to try to do my whole monthly “To Do” checklist on the first day of the month, so I could focus my time on what I considered important. At the NorCal Finals in 1977, we arrived early (in hindsight, thankfully!). I was sitting in the van and heard “Last Call, Men’s Discus.” Coach insisted that this couldn’t be right, but I grabbed my bag and said I would check it out. “Oh, there you are,” said the Head Official when I walked down. The event had just started and I was thrower number eight. A very nice family covered me while I changed from street clothes into my Skyline College uniform. I couldn’t use my discus as I didn’t weigh it in so I had to borrow one from a competitor. My name was called and I walked over to the ring and threw my first throw of the competition. On my second throw, I threw my lifetime best. But, let’s review: I had EVERYTHING in that one bag. 1. Tell me everything you need. 2. Tell me what is really important. The longer you are in any game or job, the more and more you will “clump” these checklist items down. The first time you make pancakes, you read the recipe. The twentieth time, you don’t read the recipe but forget that one egg (or whatever). The hundredth time, you breeze over the recipe clumping together the various steps, but you still check the recipe! It was the secret to success and survival in modern air to air fighting and, yes, he went into detail and, no, I ‘m not going to explain it here. It all comes down to something I call “Etching.” Etching is the term we use for drawing on glass and I love the image for training…and life, too. Etching is doing something over and over so that all the excess fluff is unimportant. Superior athletes often seem to be so simple and effortless as they move. Go to a high school or Masters track meet and watch all the flailing and excessive movements that mark the marginal athlete. When you see mastery, it seems like something you can repeat yourself. In fact, it’s hard not to go out and try a sport after you watch it at the Olympics. Wear a helmet. I have discussed this in the past several times, but people miss the real key. We had laundry baskets throughout the house and I could walk by the white laundry bin six days a week and never, not once, think “the load is getting high.” Only on Monday did I switch on the gear that told me: Wash, dry, fold and put away white laundry.” Shopping was simplified on this system as you can imagine as was just about everything else. Honestly, we KNEW what we needed to buy and kept a piece of paper with the basics handy for any one to fill in. * Salad Greens: everything you can eat raw! That’s not bad for most people, to be honest. Toss in Toilet Paper, various soaps and cleaners, and a few other things and put that in your pocket when you go to the store. Etching is the primary technical tool. It is reinforced when the coach and athlete can both look at a checklist to insure that everything is being covered. Listen, it comes down to this: Excellence is the race to 10,000 reps a year or 10,000 hours of practice (read the three books that all came out at once about four years ago that all said this). I argue that the simplicity will get you to that magic 10,000 faster than complexity. I could be wrong, but I think I have proved it with my athletes. In my blog post on Mental Set,I was wrong about coaching Defensive Backs. Well, in a way, I was wrong. I don’t have the ability to admit “total wrongness” ever. I thought a lot about reactions recently and it appears to me that we can use etchings and checklists to improve reactions. Cover Three is a basic football coverage. It simply means that the three Defensive Backs, two corners and the safety in the middle, will divide up the deep area of the field into thirds. The corners also have the sidelines which will help as the ball carrier will end the play if he touches the sidelines or goes out of bounds there. Simple, so far. The Corner has one third of the field, the deep part which is basically where long passes go, and it would be nice if he helped out on any runs or anything else. One: this would be the widest receiver on his side away from the ball. We call them Wide Receivers, Split Ends, Flankers and a host of letters. Two: this would be the second receiver “in” from the sidelines. One is closest to the sidelines, two is the next one in. Three: this is often hard to find if everyone is “away,” but it is often a Running Back in the backfield. The RULE: One can hurt me, but Two can kill me. What? If, at the start of the play, One runs into someone else’s area (the Linebacker or Safety’s area), I look for Number Two with my eyes. Often, teams will send One underneath to trick me, the corner, into following and toss the ball over my head. If I don’t see Two, or Three, attacking my zone, I can jump on One. If I see Two coming at me, I keep backing up and watching the QB. Boy, that was a lot of writing, but what happens is that this is all less than a second: Ball snaps, watch One slant in, look for two, MOVE! My eyes make me react much faster than my feet! Small caveat: Corners have to also have really short memories. No one in the stands knows when a guard makes a mistake, but everyone knows when a DB does. You have to put “Monkey Brain” back to sleep when you give up a touchdown. Oh, and for the record, the guy usually chasing the wide open guy who is scoring the touchdown is rarely the guy who made the mistake. But, Mom still thinks it was you. So, with good rules, or a good checklist, we can speed up reaction times for ourselves. It is just like a shopping list. Now, I know, I just read the book too that says shopping lists don’t really help us NOT makes stupid decisions. I still think it is better to have a list than to wing it. I stand by this. You see, I was being channeled into a compromise. I told her that anything she came up with would be fine, just let me know exactly what it is. We ate steak for a few more years on Monday after that. It still doesn’t matter what we decide to eat for any meal, just let’s make sure we shopped for it, have the items for it, and serve it on time. So, how does Cornerback play, discus throwing and my daughter’s dinner all tie together? It’s simple: it’s all about, once again, Managing Options. Now, you can do probably seven football defenses, there are three basic approaches to the discus and there are lots of options for dinner. Once you pick an approach, you can then use the Checklist (Menu, Shopping List, Playbook, Recipe, Coaching Points) to implement this idea. You want important things in your life to be repeatable. I want my throwers to succeed and pass down their insights to my next generation of throwers. I want my family fed by about six every night so we can enjoy a few quiet hours together. I want my defense to be in a position where the eleven athletes coordinate together to stop the offense. The checklist shows you the path to etching! “Lord, the sea is so large and our boats are so small.” Amen! Then, I would clap my hands and we would “go.” I have had students do amazing imitations of me and they are always based on this little ritual that I have to kick off class. I like starting a meal with prayer, not only to thank God, but to let everyone know it is time to eat! That’s the key to a ritual: it informs you of when it is time to get going. Now, some of my checklist thoughts and ritual thoughts are going to interconnect. For example, I strongly recommend taking Sugar Free Orange Flavored Metamucil the few days leading up to any competition (or travel). Now, why again? Obviously, if you don’t know, you haven’t competed enough! For me, though, the taste of it begins the process of preparing me for competition. I have so many small rituals, like smiling before I throw, that I think I might overwhelm myself with all of them. Except that they work! Now, there is always a good question: why don’t I list each and every part of my rituals? Two things: first, the ritual is, in a sense, the checklist in action. Think about a wedding and the dozens, if not hundreds, of details that must be taken into consideration. Some have poems: “Something old, something new, something borrowed, something blue.” Tiffini had me for the first one, so she only had to cover three more. Wise ministers will put a little Post It note in the prayer book reminding them of the bride and groom’s names as under pressure it is not unusual to forget people’s names you have known all their lives. So, in the middle of a ritual, checklists. So, why not write everything in a ritual? Because it can be so much information that you get lost in the details and you lose the mission or the goal. 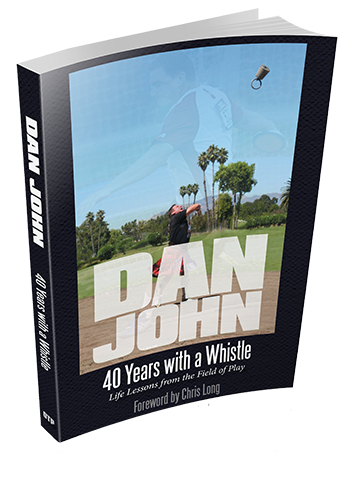 I smile before I throw, you can see the video on my “Dan John” facebook page (Like it! ), but that’s not on my checklist. Sometimes, a ritual is just that, something we do when we do it. I won a poetry contest years ago with a poem about tossing a handful of dirt on my mother’s grave. I just stood there for a moment, then reached over and tossed a handful of dirt. Father Daniel Derry and my cousin, Bill Spillane, both told me: “We didn’t know how Irish you were.” I had no idea why I did it, it was totally spontaneous and all I can think, still, is that this is something I saw others do. That’s where rituals live when done best: they sit deep inside you and well up from that place when you need calming and control. To ingrain etching and ritual, I believe in something that is best described as “Deliberate Practice.” I don’t like the term, but I can’t think of a better one. Yet. It’s this idea that I first heard from the Soviets: they did experiments with soccer players and discovered that some guys were scrimmage heroes. This group mastered every skills test, but often failed in games. Another group wasn’t up to par in these tests, but dominated the games. So, a small change was added: a heart rate monitor. What they found is that there are athletes who can dominate something when the heart rate is 90 or so. And, that is very good, thank you very much. The sport, though, was played at, say, 150 beats. Those extra 60 beats a minute completely changed the skill set. It was like what I was told years ago by a famous basketball coach: one of the three keys to winning basketball games is making free throws when tired. To master a game skill, it helps to be tired when you practice it! I used to do drills with my football team that my assistant coaches hated. One drill involved third down and fifteen yards. If the offense didn’t get the yardage, I sent on the punt team and we kicked. Then, we repeated third and fifteen. We did this over and over. Our young assistants HATED this, but my point was this: in a game, when we punt, we often only have nine or ten guys on the field. We have to PRACTICE getting the punt team on in realistic settings. For the record, we no longer had the issue after this drill. For throwers, I am famous for my “One Throw Competitions.” We set up a track meet atmosphere but everyone only gets one throw. My athletes HATE it. “Track meets have more than one throw.” Right. I agree. Unless you foul twice, then you have one throw. Or, on your last throw, you need to win the Nationals. Now, you have one throw. What I am trying to teach here is for the athlete to practice the ritual (scan that checklist) under just a little bit of pressure. It works. I used to think when I was in high school that South City had a two touchdown advantage at every home game. We were one of the very few schools with lights, so teams would come to our games without the knowledge of night games. Under the lights, they would sprint everywhere and fly around in the warm ups. I can remember hearing other schools talking about “under the lights” and “just like the pros.” An hour later, the game would start and their engines would be turned off. The reverse was true my senior year: we had played every game under the lights, cinched the league championship and played our last game at Jefferson. I hadn’t played a day game all year. I hadn’t had to check out of class, take a bus, and warm up without the big lights. We could barely get out of our way in the first half. We came back to beat them soundly, but it was a lesson I never forgot. I have mentioned before that the Utah high school state championships, as deadly boring as two days one can spend, begins at 8:00 am on Friday. As soon as I see the schedule, I start bringing my athletes who are called to compete early into school to get used to throwing at an early honor. Bowel movements, warm ups, breakfast and literally just waking up are all an issue. I am convinced that I have snuck in a state champ or two simply by teaching my kids that they need about an hour to “warm up” at 8 am versus the five minutes at two in the afternoon. That’s deliberate practice and it is the key to survival in sports.